This is a fantastic vendor for DJ/bands. 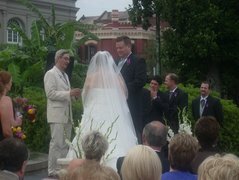 Since this was a traditional New Olreans wedding, my husband and I did a second line as well. For the reception we had a trumpeter who was then joined by a 8 piece band that followed us through the streets of the French Quarter. For the reception, we had a 3 piece band and then went to a DJ format for the dinner/dancing portion. The service was exceptional and the price was fairly close to most other vendors in the areas.